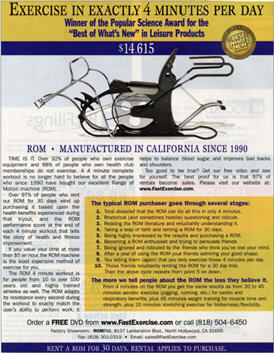 How do you sell a $14,615 piece of exercise equipment by space advertising? Rom of North Hollywood, CA has the answer. Week after week, year after year, this offer and copy have been bringing home the bacon. You can download the PDF by clicking on the thumbnail to the left. I was actually flying today and saw this add (not for the first time) in the airplane mag. I laughed because I thought… wow this thing has been running for so long. It must be pulling in leads like gang busters. Sure enough I was right. What else is funny is I’m a personal trainer (one of the so called experts) and yes I find it hard to believe. Maybe I will have to give it a try. From a copywriters perspective, they definitely attack the skepticism immediately which I think then bolsters up peoples curiosity. This is an interesting ad and a good example that space ads alone can make you millions.